The Limited part is quite literal. Type-Moon, in commemoration of the 10th anniversary of the release of the Fate/stay night Visual Novel, has just announced that it will be releasing a special Limited edition of the game. 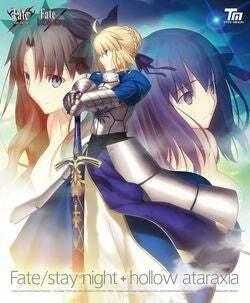 Said edition will be a pack of Fate/stay Night and Fate hollow ataraxia visual novels under the name Fate/stay night + hollow ataraxia (clever, I know). Fate/side material: This is actually a reprint of the encyclopedia book that was bundled with the Limited Edition of the original Fate/stay night Visual Novel released in 2004, full of details about the Fate universe.